NAMED FOR QUEEN Elizabeth I of England who was known as the Virgin Queen, the Commonwealth of Virginia is officially known as The Old Dominion State. The state is also frequently referred to as the “Mother of Presidents” because eight presidents were born in the state, including George Washington and Thomas Jefferson. Jamestown, on the banks of the James River, was one of the first settlements in North America. 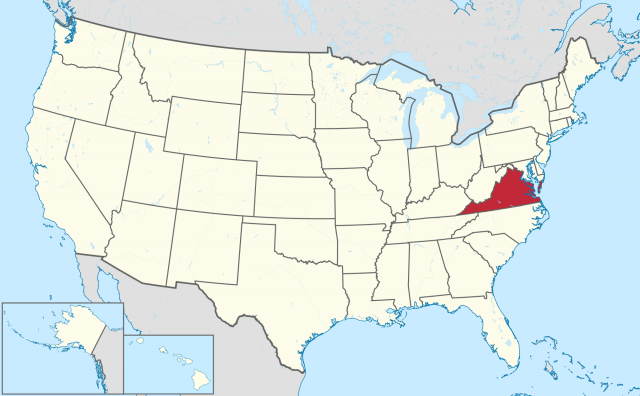 Virginia is bounded on the north by WEST VIRGINIA and MARYLAND, on the south by NORTH CAROLINA and TENNESSEE, on the west by West Virginia and KENTUCKY, and on the east by MARYLAND and the ATLANTIC OCEAN. The Potomac River flows along the northeastern boundary of the state, and the Chesapeake Bay separates the land along the eastern shore from the rest of the state. 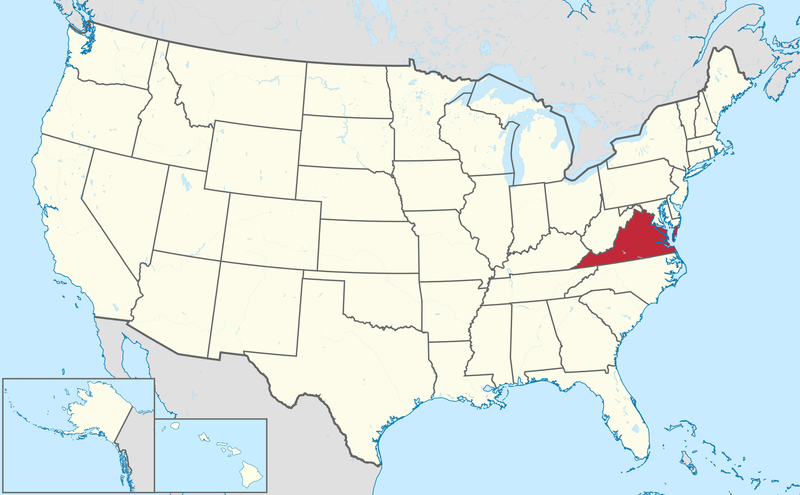 The total area of Virginia is 42,769 square mi (110,771 square km), ranking the state 35th in size. Virginia ranks 12th in population among the 50 states. Virginia’s largest cities are Virginia Beach, Norfolk, Chesapeake, Richmond (the capital), Newport News, Hampton, Alexandria, Portsmouth, Roanoke, and Lynchburg. Approximately 3,171 square mi (8,212 square km) of Virginia are covered by water, and Virginia’s coastline runs for approximately 112 mi (180 km). The state’s major rivers are the James, the Rappahannock, the Potomac, and the Shenandoah. Virginia’s major lakes are the Atlantic Intracoastal Waterway, the Gathright Dam on Lake Moomaw, the John H. Kerr Reservoir, the John W. Flannagan Reservoir, Pound Lake, and Philpott Lake. The average elevation of Virginia is 950 ft (289 m) above sea level. The highest point in the state is 5,729 ft (1,746 m) at Mount Rogers, and the lowest point is sea level, where the land meets the Atlantic Ocean. The state is approximately 440 mi (708 km) from east to west and approximately 200 mi (322 km) north to south. The climate of Virginia is humid subtropical through most of the state, but the northwestern section of the state is humid temperate. The area within the Atlantic Coastal Plain tends to have fewer hot and cold days than the rest of the state, resulting in a longer growing season. Snow is also less frequent in this area. The Cumberland Mountain area experiences more cold days and greater snowfall than other regions in the state. Overall, Virginia’s temperature ranges from 25 degrees F (-4 degrees C) in the winter to 89 degrees F (31 degrees C) in the summer. Annual precipitation ranges from 36 in (91 cm) to 50 in (127 cm). Hurricanes are infrequent and tornadoes are rare in Virginia. Virginia is made up of five distinct geographic areas. The Atlantic Coastal Plain, an area of sands, silts, and clays, comprises approximately one-fifth of the state, running north to south along Virginia’s shore for 100 mi (160 km). This infertile area, which is generally referred to as the Tidewater, is filled with numerous salt marshes and swamps, including a section of the Great Dismal Swamp. The mainland in the western part of the Atlantic Coastal Plain is separated from the area known as the Eastern Shore, which forms the southern portion of the DELMARVA PENINSULA, by the Chesapeake Bay. The land east and south of the Chesapeake Bay is flat, never reaching more than 100 ft (30 m) above sea level. In the western section of the Atlantic Coastal Plain, four necks (peninsulas) are separated by estuaries that run into the Chesapeake Bay. The area also includes hills that may be up to 300 ft (91 m) high. The entire central section of Virginia is located within the Piedmont Plain, where elevations range from 200 ft (61 m) above sea level in the eastern section to 900 ft (274 m) in the western section. At its narrowest point, the Piedmont Plain is only 40 mi (64 km) wide, but it expands to 140 mi (225 km) as it reaches the North Carolina border. At the Fall Line, where the Piedmont converges with the Atlantic Coastal Plain, low waterfalls and rapids abound. The soils of the Piedmont tend to be only moderately fertile. In the east, the Blue Ridge Region of Virginia with its narrow strip of metamorphic rocks rises steeply from the Piedmont to meet the Appalachian Ridge and Valley Region in the western section of the state. Land in the southern section ranges from plateaus with valleys and deep ravines to the high peaks of Mount Rogers. The Appalachian Ridge and Valley Region extends along Virginia’s western border. This area, known as both the Great Valley and the Valley of Virginia, nestles against the Blue Ridge Mountains. The well-known Shenandoah Valley is the largest of the valleys within the region. Caverns naturally carved from limestone and shale are found throughout the area. The Appalachian Plateau, which extends from the southwestern section of Virginia into Kentucky as the Cumberland Plateau, is filled with rivers, streams, and forests. The average elevation in the area is 2,000 ft (610 m). The Cumberland Mountains share some characteristics with the Appalachian Ridge and Valley Region; but the plateau is dominated by uplands rather than valleys. Forests make up approximately three-fifths of Virginia’s land. Oaks and pines fill the forests of the Atlantic Coastal Plain and Piedmont Plateau, while oak tulips, beech tulips, and maples are found in the western section of the state. Other Virginia trees include the dogwood (the state tree), red and white chestnut, willow, oak, shagbark, pignut, bitternut, hickory, and loblolly, Virginia, short leaf, and pitch pines. Flowers include the dogwood (the state flower), mountain laurel, rhododendron, trailing arbutus, and violet. Animals found in Virginia include white-tailed deer, red and gray fox, raccoon, skunk, opossum, cottontail rabbit, groundhog, squirrel, and muskrat. Black bear are found in Virginia’s mountain areas. Winters find the Chesapeake Bay area full of various kinds of migratory birds. The state has 15 state forests and 34 state parks. Agriculture dominated the economy of Virginia until the 20th century, when it was supplemented by mining, tourism, trade, and government jobs. Onethird of Virginia’s jobs are in the service sector, including a large number of jobs in computer and data processing centers. Manufacturing industries include transportation equipment, electronic equipment, textiles, apparel, lumber, wood products, furniture, chemicals, and food processing. Virginia ranks in the top 10 of American states in the production of tomatoes, tobacco, peanuts, apples, summer potatoes, sweet potatoes, snap beans, and turkeys and broilers. The dairy industry is also essential to Virginia’s economy. Virginia is a top producer of coal. Other minerals include various kinds of building stone, limestone, sand and gravel, natural gas, lime, clay, zinc, kyanite, feldspar, gypsum, talc, uranium, and vermiculite.